Monday mornings, you guessed it, are not a good thing. Especially when it’s all rainy and you get run over by a car. Luckily nothing really happened to me, only a few scratches and a new experience (I’ve never had this Hollywood style “rolling over the hood of the car” thingy happen to me before). Let’s move on to better stuff then maybe I can even write about KDE related things. Just now I got the confirmation that KDE will have a booth at the 2nd Ecumenical Church Day which is way in the future – May 2010. More about that later. What I wanted to talk about… Yesterday, Eckhart moved Attica into kdereview. Someone in my head: So you might wonder, what’s that stuff good for anyway??? Someone in my head: Wait! You are telling us, you just wrote a facebook clone? Me: Not exactly. We still have KDE and our users in mind. 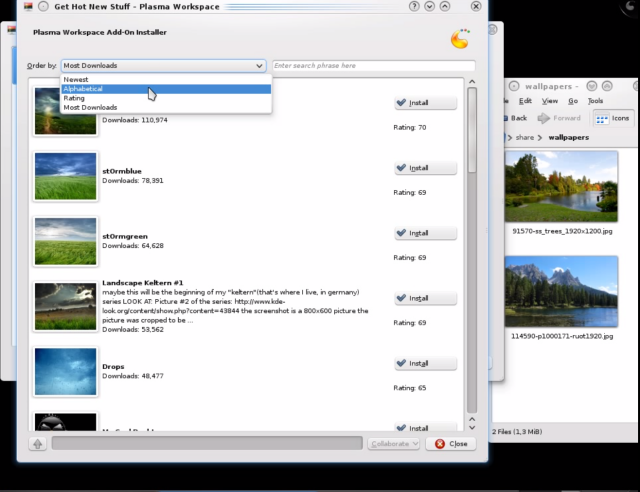 So imagine, you really like some application that is also on kde-apps.org. And since you use it daily and it’s really cool, you decide to become an fan of the application (come on, just click that button, it doesn’t hurt!). Now the author of your favorite app publishes a newer version. And you get a note right to your desktop, that a newer version is available. Me (interrupting rapidly): More goodness comes from the neighbor list. Say you come to Stuttgart for a short visit. And once you go online there, you see, one of your favorite KDE developers is actually in town also. Quite interesting you think and just a click later you have sent a message to meet up. What a nice evening! Or take the event list. Here you get notified, when an event takes place close to your location. Get notified of that developer sprint next door and just drop by to meet all the cool kids. I admit, these examples are still a bit KDE-geeks-are-great centric. But they are just examples and the beginning. More stuff is yet to come. Maybe you have ideas too? Ok, enough talking, let’s see some action! Looks really nice. Another thing I’d love to filter by is image size and aspect ratio. Ideally, GHNS would pick this up automatically from my current video settings and then filter the images that I see to the ones appropriate for my screen’s resolution and aspect ratio. Hi,I dont’ know if you are one of the developers behind GHNS…I like your ideas about promoting nicest works with this kind of “voting”.I had some ideas for GHNS,I wrote them here https://bugs.kde.org/show_bug.cgi?id=191025 .Someone already proposed the automatic updating in kde brainstorm,i conseider that a really good idea! @Kyashan: yes, automatic updating is something we also want to implement, it all just depends on what time permits… For now the most important thing is to get things cleaned up a lot and polished so we can include it with KDE 4.4 and after a big overhaul of the framework we can easily check for updates automatically. The user can then be asked if she wants to install the updates. There was some talk about “approved/checked” scripts such as plasma applets, but getting that right will take some more work from all parties involved. Especially making sure, that reviews are up to date will not be easy. When choosing graphical things like background images or kdm splash screens I would like the thumbnails to be a bit larger. Maybe twice as large. Also presenting them in a grid instead by rows could bring more thumbnails onto the screen so maybe you could catch a nice screen faster. But searching on the server to find new content is a really good thing. @arwa: I like the grid idea, maybe we can make that optional, since for some applications it makes not much sense. Right now getting everything to work is of course more important. And yes, we want to support showing more than 20 items for one search. Either by letting you advance a page or having the list grow as you scroll down. @Frederik true… you would definitely want something that indicated you were only seeing images that matched your screen size, rather than only seeing a subset of the available images with no explanation as to why. Perhaps if images that didn’t match your screen res were greyed out or subdued, or some other subtle visual indicator was in place to indicate that a given image was either fit for your screen or sub-optimal in some way (wrong aspect ratio, lower res than what you run etc). Perhaps a ghost image of your screen dimensions overlaid on the wallpapers that aren’t a good match so you can see why they aren’t a good fit for your screen.